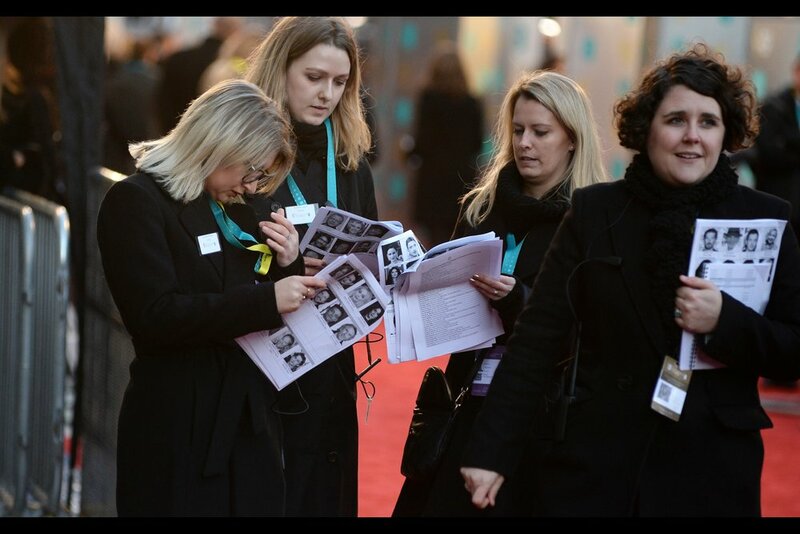 Last year, which was the first year the Baftas went ‘random’ with their wristband distribution method via a 10am tweeted location for wristbands, they celebrated by handing out less than ever before : just 500. And I missed out by NINE people. And wasn’t able to gain entry. This year they handed out even LESS wristbands on the day, and when all was said and done, and second-chance queues led to the possibility of overflow pens and extra space being created, and me even being in a line to have my bag checked for entry…. I missed out on getting in to the event by FIVE people. And wasn’t able to gain entry. So, no, technically I’m not on or adjacent to the Baftas Red Carpet.. but where were you? The security staff who had literally stated that (1) we’d all get in and (2) we should get in the queues to have our bags checked … were now apologising to us and reassuring us that we absolutely were not getting into the Bafta event. And yet… we weren’t told to clear the area either….. The boundary between the organisation and pomp of the Baftas and the cold, grey, talentless and artless rest of the world has a surprisingly cheap-looking border. There’s a metaphor there somewhere, I suppose. Our first arrival from the world of films arrived so early and to so little fanfare that I reflexively took just two (2) photos of him before I was distracted by the newly arrived cast of Cirque Du Soleil. He’s Barry Jenkins - who won the Best Director Oscar in 2017 for ‘Moonlight’. “We’re the financial consultants, obviously. Why… who do YOU think we are?” - outside chance they’re from Cirque Du Soleil : Totem, but I would never want to flagrantly dismiss the possibility that somebody has finance qualifications…. also, was that an Oscar-winning director I just photographed walking past??? The Baftas are sponsored by EE, a company that, if they know you once bought a data pack (ironically for Bafta location tweet purposes) they will subsequently send you a reminder text every M&THERF&&KING workday for a full F&&KING year (and beyond)… that if you want more data, you’ll have to pay for it. “Your baguette’s half eaten but your ice tea is two-thirds drunk. I’m not saying it’s illegal… but it IS suspicious.” - well, I was only a BIT hungry. And not that thirsty. It’s not quite 5pm but the first guests are arriving. The light for now is good…. and the dude to my immediate left who’s suddenly shoved himself between me and the person who used to be to my left is tall and blocking some of the wind. So… I don’t mind quite so much. It’s not quite 5pm and we have our first film arrival who wasn’t Barry Jenkins, who I basically missed : this is the double-Oscar winning composer Alexandre Desplat (who composed the scores for such films as Unbroken, Monuments Men and The King’s Speech but won Oscars for Grand Budapest Hotel and The Shape of Water) - and he signed my journal! Bohemian Rhapsody’s Lucy Boynton demonstrates the consequences of missing the precious few seconds when somebody exits a car and nobody (or not enough people) from the crowd calls out a name. Which is : no front-on photos. “So you see how without touching him, I’ve nonetheless demonstrated my complete contempt for him, his jacket and the organisation he works for. That’s an awesome scarf you’re wearing, by the way… exquisite” - Jon S Baird is the director of “Stan and Ollie” which had its BFI London Film Festival premiere last October..
“I know you’re a fan of QLD in the State of Origin : hope you approve!” - the lovely Amy Adams is now up to six Academy Award Nominations without a win… and the sixth is this year for ‘Vice’. I think I last photographed her at the BFI London Film Festival premieres for ‘Arrival’ and ‘Nocturnal Animals’. Some days the blonde lady in the foreground gets you, some days the dude in the distracting high-viz vest in the background gets you. And some days it’s both. I’ve only just started watching Season 1 of “Star Trek Discovery” and Jason Isaacs is in that. “No, none of the letters have accents or diphthongs or umlauts… but you’re probably still going to spell it wrong” - Yalitza Aparicio is in the Bafta-nominated‘Roma’ whose BFI LFF Premiere was last year. “What do you mean ‘somebody else’s hair looks just like mine… that’d better just be my reflection in the car window you’re referring to….” - Cynthia Erivo is/was one of the EE Rising Stars nominated on the night (she’s in “Widows” and “Bad Times at the El Royale”). “I know they’re calling out my name… but they’re saying the ‘E’ in Richard E. Grant wrong, and I’m not going to reward that kind of thing” - Richard E. Grant was most recently in ‘Can You Ever Forgive Me?” with Melissa McCarthy. “The day I need you to help tie my bow tie is the day I need you to hand me a gun so I can shoot you for the insolence…. now let go” - fashion designer Valentino has a storied history in the world of fashion, but he also played the role of ‘Valentino’ in, among other things, Zoolander 2. “Well no wonder Richard wouldn’t sign - look how you’ve misspelled the ‘E’ in Richard E. Grant - I’m surprised he didn’t have is personal assistant spit on you all. Still… nice that you’re here this evening..” - Steve Coogan most recently played the role of Stan Laurel in “Stan and Ollie”. “It doesn’t get any less transparent the longer you stare at it, I can assure you” - I don’t know who this is, and the precise nature of the transparency of her dress was (sadly) not documented by me at this event. “The person with their hand on my waist is very short, has tiny hands, and the next words he says will be in a considerably higher pitch than his usual speaking voice. Thanks for coming!! !” - Melissa McCarthy is in (and was nominated for / at the premiere of) “Can You Ever Forgive Me?”. “Of course I’m wearing a tie under here… just don’t look, that’s all. Why? … no reason….” - I think this is Gwylim Lee who played Brian May in ‘Bohemian Rhapsody”. “Of course I brought my ticket to this event… just don’t ask me to present it that’s all. Why? … no reason….” - I think this is Ben Hardy who played Roger Taylor in ‘Bohemian Rhapsody”. I’m not sure who this is, but somebody said “famous Japanese director” so it’s probably / likely to be Hirokazu Koreeda who directed the highly regarded Bafta/Oscar nominated “Shoplifters”> I've watched the film, and though I tried to love it…. I thought it was good. I really want to remove or edit around the orange/white witches hats in the background of this photo of director Peter Jackson … but they’re kind photographically load-bearing (somehow). I last photographed him at the premiere of “Mortal Engines”. “I can give all of you four seconds of my time. Ordinarily it would be five, but the calculation of how many seconds I could afford to give you took longer than anticipated.” - Jamie Bell was most recently in / at the premiere of “Film Stars Don’t Die In Liverpool”. “You want to take a posed photo of me? Okay.. .but what’s in it for me? ” - it’s Olga Kurylenko, from any number of things including “Oblivion”, “Johnny English Strikes Again” and… erm…. “Quantum of Solace”. The Crown’s (and The First Man’s) Claire Foy discreetly zips past while I am distracted by Olga Kurylenko, which I feel bad about, but perhaps not quite as bad as I should. “And you’re certain the lens cap should be on? Okay, then….as long as you’re committed to making this an intimate portrait by your Method” - I last photographed Eddie Marsan a mere one week ago at the premiere of “The Kid Who Would Be King”. “Wait… you’re NOT wearing the tracksuit top I bought you? But it’s so much warmer than this is…” - Viggo Mortensen is best known for being Aragorn in The Lord of the Rings, though I’ve photographed him at ‘A Dangerous Method’ and ‘The Road’. He’s most recently in ‘Green Book’. Henry Golding was in the excellent “Crazy Rich Asians” AND the excellent “A Simple Favor” - both released last year. And I don’t have to scream out my approval - the dozens of girls around me are more than up to the task. The arguably even MORE cool Michelle Yeoh is also in ‘Crazy Rich Asians’ but her filmography is massive - I’d never previously photographed her, and if you’d asked me who I’d be most disappointed NOT to photograph had I totally missed this year’s Baftas I would have said (1) Her, (2) Spike Lee. “I’m doing this only because I’m unspeakably cool, and you appear to know and appreciate it.” - Michelle Yeoh = very (very) cool. “I don’t care if I have to rough up a couple of dealers in the name of Security as long as you let me in…” - Dexter Fletcher has directed films such as “Wild Bill” and “Eddie The Eagle” - he also completed directing duties for ‘Bohemian Rhapsody’, though Bryan Singer retains sole credit. “This long-distance high-five goes out to anyone wanting to remotely express how much they liked The Last Jedi. And no, I’m not saying whether I did.” - Adam Driver was at That Premiere, though he stormed past with quite the in-character sense of vengeance, which I kind of appreciated. “And imma keep it up here a bit longer for anyone who DIDN’T like that movie. It’s not like I care - say what you will, the Mouse’s cheques ALWAYS clear"
“What do you mean you FORGOT MY CAR KEYS - they were in my trouser pocket … of the trousers I am wearing RIGHT NOW when I put them on! !” - Chiwetel Ejiofor was Oscar nominated for ‘12 years a slave’ but was also in the excellent ‘The Martian’. “I love how generous you are with the letter ‘s’, but my name doesn’t really have that many of them….” - I recently photographed Andy Serkis at ‘The Kid Who Would Be King’ but he’s also directed (‘Breathe’) and been a mocap subject in Lord of the Rings and Planet of the Apes. “I can’t stop, but I can slow down slightly for you to take this photo.” - Salma Hayek is both very friendly and surprisingly fast-moving. “If youda brort it here… I’da signed it…” sadly I never did bother to keep my bottle of Absolut Brooklyn Vodka (“a Spike Lee Joint”) after I didn’t get it signed at the ‘Blackkklansman’ Gala/Screening last year… However, I have now photographed Spike Lee. “No way I’m telling you where to get this jacket, because the fact that you want it suggests you have good taste, which is why I think it’s important that you NOT be able to get your hands on it and dilute the cool factor”. Eh… my choice of beanie at this event probably deserved that. This is Mahershala Ali - he won an Oscar for Best Actor for ‘Moonlight’ and he’s also in Alita Battle Angel (though he wasn’t at its premiere) - edited to add he won Best Supporting Actor for ‘Green Book’ on the night. Forget every other person you were here to see - if you’re under the age of 30 (50?) and female (and not even necessarily female), you too would have screamed loudest for Timothée Chalamet - he was in ‘Beautiful Boy’ ,whose BFI London Film Festival attendance resulted in pandemonium not seen since my train company last had a service meltdown. Which was this morning, because they’re f&&king incompetent a&&holes. Quite a lot more people were visibly shaking (not just screaming) at his cheerful approach. I wasn’t complaining, though - my recent cold has left my hearing reduced, and shaking/friction creates heat and it’s certainly cold enough this evening. “Is it cool that you’re so overcome with emotion that you can barely hold your mobile phone steady? Baby… it’s MORE than cool!” - of all the people who arrived, nobody signed and posed for more people outside the event than Timothee Chalamet. “Oh, if there was but no fence dividing us that stretched yonder for no more than five or six metres, we would be together right now, my darling!” - AND Timothee Chalamet crossed to the other side of the road to greet fans too. Impressive. Linda Cardellini plays / played Hawkeye’s wife in Age of Ultron, but perhaps more specifically to the relevance of these awards, she was in ‘Green Book’. Identification (possibly) pending.. but I do like the casual half (quarter?) wave. “Nobody’s calling it “Bo-Rap” yet, so I’m quietly confident we’re still held in high esteem…” - also arriving at the drop-off area on foot : Rami Malek, who played Freddie Mercury in “Bohemian Rhapsody” - and won the Best Actor BAFTA on the night for it. A row of hands for high-fiving Rami Malek? Eh… I’ll put the camera down for that. He was great in Bohemian Rhapsody. “Your website? It’s pretty cool - though for legal reasons the definitions of “your” and “cool” might need to be clarified. By my lawyers. Not me” It’s Alfonso Cuaron : he directed ‘Gravity’ and the third Harry Potter Movie - but his film ‘Roma’ took home not one but FOUR Baftas on the night - Best Film, Best Foreign Film (! ), Best Director and Best Cinematography. Given he wrote, directed AND was cinematographer for it… it was kind of a good night for Mr Cuaron. “I was at the premiere… where were you?” - only the presence of (possibly metaphorical) robot sentry guns, barbed wire, anti personel mines and zero fans being allowed by Disney prevented me from even standing near the “European” premiere of Black Panther which was (allegedly) in London last year. Letitia Wright was in that movie, and won the EE Rising Star on the night. “Yeah, I was in that. What’s it called again?” - Rachel Brosnahan is/was in both the series “House of Cards” and “The Marvelous Mrs Maisel”. “Adam Driver did this? Well in solidarity with him, I’ll do the same” - Will Poulter. “I don’t care where that guy’s pointing, I’m doing it like this!” - Bradley Cooper starred in and directed “A Star Is Born” - which won the ‘Best Original Music’ Bafta on the night. “Partially illuminated by the red light of at least one car’s rear lights… I’m pleased you got the memo” - Olivia Colman won the Best Actress Bafta on the night for ‘The Favourite’. So … was that it? Almost. A Bentley accompanied by an honour guard of police on motorbikes sped past without stopping…..
…. was a lot better than nothing. Even if the background of chain-link fencing, signage and car doors isn’t quite the same as the on-carpet glitz and logos and privilege. So despite having a cold for the second year in a row, and not having a wristband for the second year in a row… I got some pictures this time around. And lo, I have a Baftas Journal Entry for this year, to go with the ones for 2010, 2012, 2013, 2014, 2015, 2016 and 2017. Now I just gotta do the RedCarpetMonochrome journal. But that’ll be tomorrow. I mean… today. It’s late. I mean… .early.